The wallet is a staple of a British gentleman’s style. Not only practical, the wallet is a way of showing who you are to the world. Traditional or modern; classic or eccentric – it’s an extension of your character that you carry with you every day. At Whitehouse Cox, we believe every gentleman should own at least one quality crafted, beautifully designed wallet that’ll last for years to come, which is exactly why we created our range. 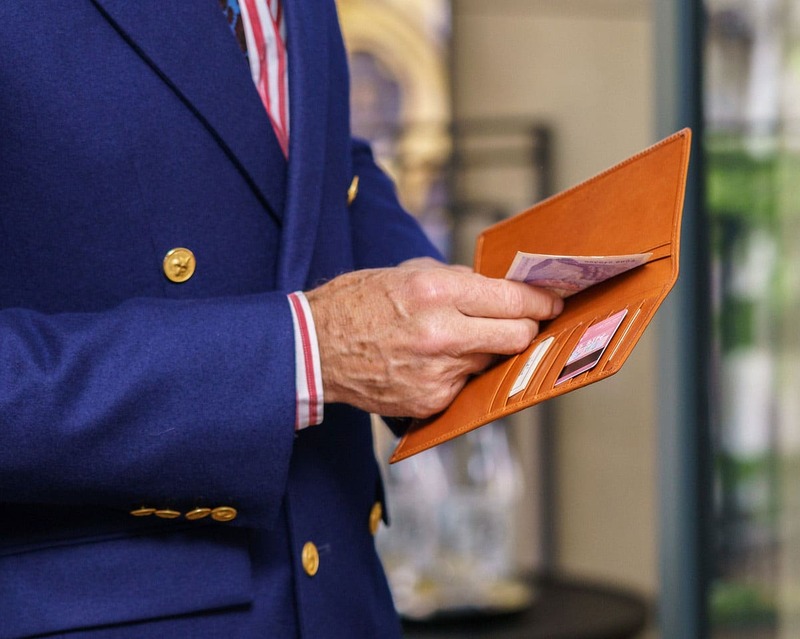 Hand-crafted in the UK, made from the finest of leathers, and designed to last up to 10 years with daily use, each of our gentlemen’s wallets make an exquisite addition to one’s wardrobe. Find your perfect style with our guide. For a gentleman in need of a practical yet stylish wallet, with enough room for all his notes and cards, the Full Size Wallet is ideal. Take it to the office, when you go out for a meal, or for an evening of cocktails – it’s minimalistic design makes it suitable for any occasion. Add a little colour to your wardrobe with contrasting colours, and appreciate the fine stitching that embodies the hand-crafted quality of Whitehouse Cox goods. With everything you need in a compact size, the Hipster Wallet Bloomsbury is ideal for everyday use. The unbeatable Whitehouse Cox quality also ensures that, even with daily use, this wallet will last for at least 9 years. Space-saving and suave, it’s a must for the gentleman who loves practicality and design. With the same professional, sophisticated style as the Hipster Bloomsbury Wallet but with added space to store more cards and notes, the Tall Hipster Wallet finds the ideal balance between practicality and design. The fine stitching detail, quality leather, and variety of colour options make it a must for every stylish gentleman. Embrace classic English style with The St. James Wallet. With a bi-fold design and crafted from bridle leather that wears uniquely with use for a gently aged finish, it’s a beautiful piece. Durable and with plenty of pockets, you can rely on this wallet to be all you need for daily use. If you are known for carrying around a lot of cards but not so keen on change, the Credit Card Notecase is the perfect addition to your accessory collection. Keep all of your cards organised and in one space with this sophisticated notecase. Thin enough to slip into the inside pocket of a suit jacket, and with a selection of stylish colours to match the design to your own unique look, it’s a must-have piece. Discover the full gentlemen’s collection here. If you have any questions about the leather wallets we’ve mentioned here, or about any of the other products on our website, please don’t hesitate to get in touch with our team. We are always happy to discuss our designs and help you find exactly what you are looking for. What does being a ‘gentleman’ mean to you?